Find a Coach / Bus trip that explores Baltic. There are 36 tours to choose from, that range in length from 8 days up to 18 days. The most popular month for these tours is August, which has the most tour departures. "Great tour guided very professionally and with great care for the individuals in..."
"A great, fast and effort way to see the 3 countries. Well organised and good selection..."
"the tour was well organised and well cordinated However two nights in each town except..."
"Just week ago came back from the Baltics! Tour was absolutely great with definitely..."
"The very different lives and extraordinary lifestyles & cultures. 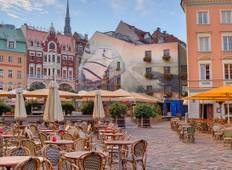 Really enjoyed..."
"Hello, Baltic Tours! I am a little bit difficult type of person, I am traveling a..."